House Minority Leader Nancy Pelosi of Calif., smiles as she is cheered by a crowd of Democratic supporters during an election night returns event at the Hyatt Regency Hotel, on Tuesday, Nov. 6, 2018, in Washington. Democrats secured the House majority Tuesday night for the first time in nearly a decade with a projected majority of as many as 35 seats. The victory promises a new era of checks on the Trump administration's healthcare regulatory agenda as well as a possible odd-couple alliance with the White House against Big Pharma. The GOP held the Senate as expected, gaining on its slim margin with at least two pickups in Indiana and North Dakota. This tightly calibrated Congress likely won't push any major healthcare legislation. And Obamacare will remain in place—albeit tweaked at the state level and through administration policies so the law increasingly looks like a mix of competing Democratic and GOP visions. Analysts don't expect any big-picture legislation as the sprint to the 2020 presidential election begins. In the especially polarized politics of healthcare, each party bends with their voters, said Robert Blendon, a Harvard University professor of health policy and political analysis. While healthcare polls as a top issue with the majority of voters, priorities shift fast depending on which party is surveyed. “If I were (saying this) in the mid-1990s, I would say the issues top of mind for all voters would determine what the new House would actually do,” Blendon said. Pundits called this midterm cycle a base election: healthcare in the 116th Congress will depend on finding the give in the gridlock over a divisive topic. "We've become a lack-of-oversight committee," Rep. Raja Krishnamoorthi (D-Ill.), ranking member of health subcommittee for the House Oversight and Government Reform Committee, told Modern Healthcare. "We haven't used our subpoena power to root out corruption." With their new weapon of subpoenas, Democrats say scrutiny will be tough. And it will likely start early. On healthcare, they want the CMS' documents surrounding the agency's approval of state waivers to add work requirements to their Medicaid programs and details of HHS' management of the detained migrant children in their care. Then there's the Affordable Care Act. Democratic lawmakers for the past two years have blasted the Trump administration for regulatory changes that they deem "sabotage of the law." "I think a lot of people are concerned about ACA implementation," Krishnamoorthi said. "We're seeing administrative sabotage of the ACA, and we absolutely have to investigate that." In a signal of what's likely to come, Krishnamoorthi joined the Oversight Committee's ranking Democrat, Elijah Cummings (Md. ), on a September letter demanding that current GOP Chair Trey Gowdy (R-S.C.) subpoena HHS for the administration's records around the Medicaid work requirement waivers that have been going out to states. As attested to by former Obama administration officials who found themselves caught in a slough of oversight queries once Republicans claimed the House in 2010, subpoenas and oversight hearings jam schedules but ultimately doesn't divert regulatory work. Still, following an election that swept them to power as a referendum on Trump, some Beltway insiders doubt Democrats will bend much. Pharma's panic level will depend on how well this relationship can work, and that's not only up to Democrats: it's up to the White House and Trump's top lieutenants as well. 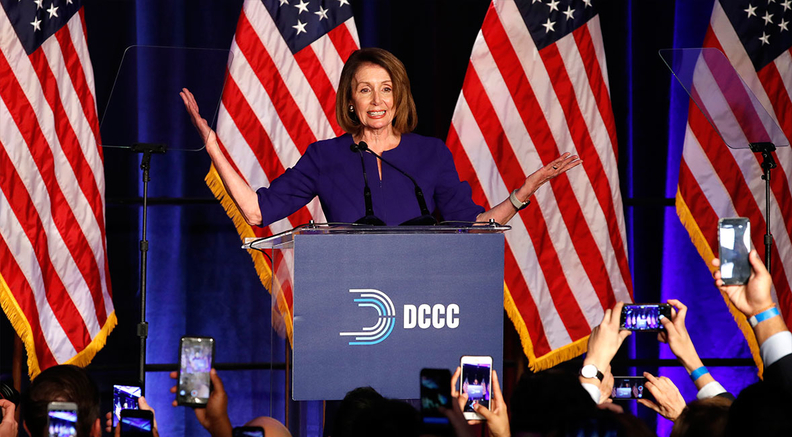 In her victory speech Tuesday night, House Minority Leader Nancy Pelosi (D-Calif.)—expected to stay on as speaker of the House given the party's success—said Democrats would pass legislation for direct Medicare negotiation with drug companies. This was a core part of Trump's own campaign platform. But HHS Secretary Alex Azar has pushed back on such a policy. Key lawmakers poised to step into influential committee positions have criticized the Trump administration's drug pricing strategy for not going far enough. These include Cummings on oversight; Rep. Lloyd Doggett of Texas who may get the House Ways and Means health subcommittee gavel; and Vermont's Rep. Peter Welch, who sits on the House Democratic Steering and Policy Committee and the House Energy and Commerce Committee. As a counterpoint, however, Pharma ally Rep. Anna Eshoo, a Democrat who represents a biotech-dominated district in California, is next in line for the Energy and Commerce health subcommittee gavel. This may have been a base election, but House Democratic candidates played safe ground on healthcare, rooting their message firmly in the ACA—newly popular with voters—rather than single-payer ideas embraced by the progressive flank. The campaign talking points on Obamacare followed an offensive play against Republicans for trying to weaken current laws protecting coverage for pre-existing conditions. Candidates and incumbents vowed on the campaign trail to protect this coverage enshrined in the ACA. So where do Democrats go from here with those promises? Individual Democratic lawmakers in pre-election interviews unanimously said they want more outreach and marketing funding for the open-enrollment periods—a priority they have repeated often since the Trump administration slashed those budgets. And this smaller budget item is possibly doable, although data so far hasn't shown a big swing in enrollment since the cuts. Not that this encompasses Democrats' wish list. House Ways and Means Committee ranking Democrat Richard Neal of Massachusetts and Energy and Commerce ranking Democrat Frank Pallone Jr. of New Jersey last spring outlined several main priorities for ACA focused on more funding: higher tax credits for people who need subsidies and wider eligibility for both the subsidies and the cost-sharing reduction payments used to offset out-of-pocket costs. While aides say the draft is a starting point that likely needs tweaking, the proposal in its current form excludes, significantly, restoration of the cost-sharing reduction payments Trump halted in his first year in office. The move led to higher premiums for the unsubsidized. But many on the left who first criticized the act as "sabotage" now don't want to see them restored because the cutoff ended up increasing subsidies for low-income enrollees. However, most of the Neal-Pallone list likely would not pass the GOP-held Senate. As health insurance co-pays and deductibles rise and provider networks narrow, price woes will stay top of mind even as the ACA becomes more entrenched in insurers' business models. Nearly 75% of individual market plans restrict their provider networks, according to the consulting group Avalere—a steep rise from 2014. Nearly 90% of people in exchange plans hold the IRS definition of a high-deductible plan of more than $1,300. So as 2020 approaches, voters' focus may stray from the Obamacare coverage arguments while remaining keenly focused on their wallets—as Pelosi and Senate Republicans seem to be aware. One longtime House Democrat said she for one wants to see more compromise on the many healthcare issues "that really aren't partisan." "Everybody's up again in two years and that includes a number of key Republicans in the Senate," said Rep. Jan Schakowsky (D-Ill.). "In terms of bipartisanship I look rather fondly back to the Bush administration when we actually got things passed and done. And in part that's because the definition of the job included the word compromise—it wasn't a dirty word back then." Starting today, the marathon to 2020 begins. Likely Democratic candidates Sens. Kamala Harris of California, Elizabeth Warren of Massachusetts and Cory Booker of New Jersey have each endorsed “Medicare for all,” the single payer plan championed by Sen. Bernie Sanders (I-Vt.). While Democratic leaders—and lobbyists—are trying to keep the focus on the ACA, the new 70-member Medicare for All Caucus wants to make single payer a viable conversation despite intense industry angst. The immediate fate of the “Medicare for all” plan, whose logistics are still very hazy, depends on how the issue plays in the Democratic primaries. Certainly Republicans have already tried this cycle to paint the party as single-payer champions even though a clear majority of House Democratic lawmakers don't support it. For now, he added, it's a "provocative message with little impact inside Congress." Correction: Rep. Raja Krishnamoorthi (D-Ill.) is the ranking member of the health subcommittee for the House Oversight and Government Reform Committee. An earlier version of this story misstated his position on the subcommittee.